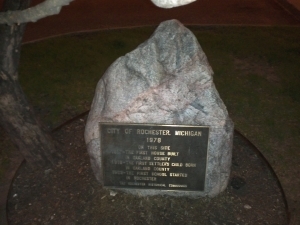 Rochester is a lively city with a rich history. 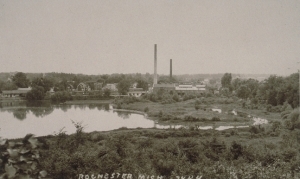 The Village of Rochester was formed on April 12, 1869, and became a city in 196, but the first settlers arrived as early as 1817. According to the US Census Bureau, the city has a total area of 3.9 mi and a population of 11,002. The first settlers in what would become Rochester, the Graham family, built a log cabin in 1817. The cabin was located where the Quik Pik and Penn Station exist today. 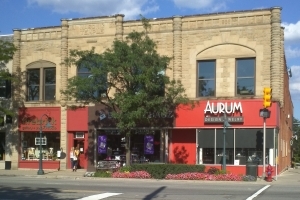 The Rollin Sprague Building is the oldest commercial building in the downtown Rochester. It was built in 1849 of coursed cobblestone and has housed "The Home Bakery" since 1930. 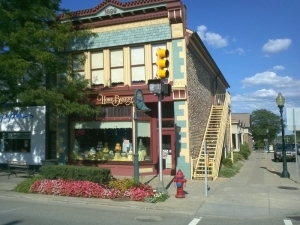 The Opera House Building, currently the site of Lytle Pharmacy, opened on November 8, 1890 as the social and cultural center of town. It featured movies, lectures, dances, commencements, etc, until 1933. Ironically, an Opera was never staged. This building was refurbished in 1987. This building, completed in 1900, served as the Rochester Masonic Temple for 60 years. This building also housed the Rochester Savings Bank, and the town's post office at one time. A historical marker commemorates this location. 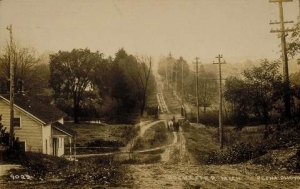 In this photo, taken around then year 1900, you can see one of the street cars which used to run along Rochester Rd. 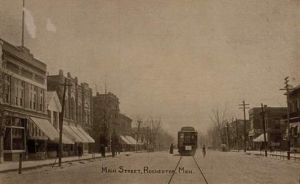 These street cars connected Detroit with its suburbs. A second track (to accommodate 2 street cars simultaneously) was built after this photo was taken. In 1961 these passenger trains were discontinued due to a low patronage. 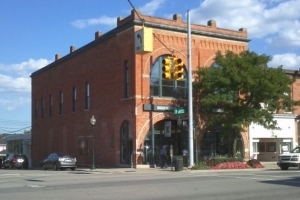 This building (build in 1872) originally housed a train station in Rochester Michigan. Passengers loaded the train at this location, and farmers loaded their grain just down the road at the grain elevator. 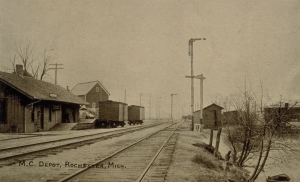 Rail travel peaked around 1900, with 8 passenger and 25 freight trains traveling through Rochester everyday. Shortly thereafter, the Detroit United Railway began a streetcar service to Detroit which drew business from the railroads. The Rochester Grain Elevator, originally named Griggs Grain Elevator, was built in 1880. Until the 1970s, farmers brought their grain to the elevator to be shipped to Detroit. 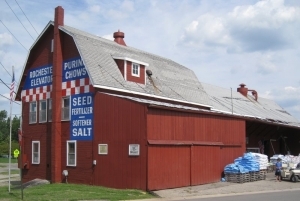 After that time, its primary use has been as a supply store. An attempt was made to restore the building to its former appearance during the summer of 2009. The Western Knitting Mills, a large brick building on Water Street, was built in 1896. At one time, its output of 100,000 dozen pairs of gloves annually made it one of the largest glove producers in the world. Today the mill is fully restored, and home to The Rochester Mills brewery restaurant and several businesses. The city became an industrial center with bundant water power from the Clinton River and Paint Creek. The interconnected waterways are no longer used for travel or local industry, but provide natural beauty, some fishing, and a healthy portion of the Clinton watershed. The site of the Library and Post office was once part of Chapman Mill Pond. The pond disappeared during the Flood of 1946, when a dam broke and the pond flowed into the Paint creek. Water Street was formerly situated at the edge of the large pond and remains by its name as reminder of the pond's former existence. Content from Wikipedia is released under the Creative Commons Attribution-Share-Alike License 3.0.